What are the different cups and trophies played for in India? The Image Gallery includes images from Polo Matches and Tournaments. Online Polo Greetings. Additional categories will continue to be added. Polo Clubs in India? Where are they? Who plays for them? List your site on our Polo Links page. Increase hits to your site. To create a web site for your club, team, business please contact us. Indianpolo.com is creating a comprehensive database of Indian polo players which includes photographs, handicaps, club affiliations, player profile, contact information. To get included in this database please send us your photograph, contact details (incl. e-mail) & any other information you would like to add. VISIT OUR IMAGE GALLERY TO SEE PICTURES FROM THE CAVALRY, DELHI, JAIPUR POLO 2008 - 2009 SEASONS. India to take on South Africa, and Pakistan to play Australia in the semi-finals of the Polo World Cup 2011 Zone D playoffs being played in Malaysia. Ajit Medtia, the 39 year old Oldham-born property tycoon and owner of the Red Lions polo team, whose fairytale life included marriage to Princess Shruti Kumari and playing polo with the future King of England, died last Friday after a critical illness. 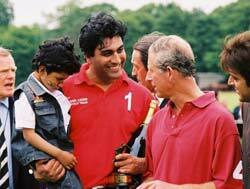 Ajit went on to fulfill a longheld ambition of playing in a team alongside Prince Charles in 2003.
Who's playing polo in India? What are their handicaps? Who are the top players in the country? Let others see what you think of the site. What it needs or what you like. Test your Polo knowledge. Take the Polo Quiz. How good is your Polo knowledge? Do you manufacture or sell (in India) Polo items ? Indianpolo.com is creating a marketplace for makers and sellers of Tack, Equipment, Sticks, Clothing, Hats, Gift items, etc. To be part of this market send us your product details including photos and contact details. Send us details of your Polo Club including contact information, activities, calendar of events, membership details, photographs, and any other polo related information you would like to add. Indianpolo.com has been launched to create awareness about the sport of polo in India. Our goal is to provide regular updates on the polo activities in the country, both for the polo fraternity and the non-polo related people. We will educate the people on polo with regular articles, basics of polo for spectators, how to start playing polo, Polo Quizzes, and other events. Copyright ã 2001-2004 Indianpolo.com. All rights reserved.